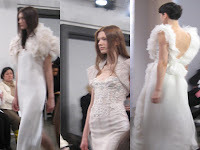 The Spring 2008 Monique Lhuillier collection created a soft, feather weight and luminous look for the season. Monique Lhuillier states "The beauty surrounding me in the Tuilleries Gardens in Paris inspired romance in the crisp air. I wanted to bring back the excitement in Bridal Couture using hand made techniques. Caging flowers on corsets, twisting and fraying silk tulles and organzas...Misty grey shades and ombres helped create an overall romantic and effortless feeling"